Learn about local culture on a Sacred Valley tour. Walk the challenging Salkantay trek alongside the magnificent Salkantay mountain all the way to the ruins of Machu Picchu. Take a guided tour of Machu Picchu, the lost city of the Incas one of "The New Seven Wonders of the World ". Day 1: Cusco arrival transfer. Afternoon at leisure to acclimatise. Day 2: Cusco city tour. Day 3: Tour of the Sacred Valley. 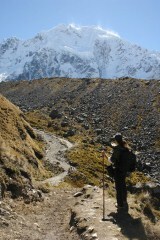 Day 7: Salkantay Trek: La Playa to Aguas Calientes and overnight in your hotel. Day 8: Tour of Machu Picchu before returning to Cusco. Day 9: Cusco departure transfer. Add in a 3 or 4 day trip to an Amazon lodge. Visit Bolivia's spectacular colonial cities including Sucre and the mining town of Potosi then onto the incredible Salar de Uyuni by 4WD. On arrival in Cusco you will be met and transferred to your centrally located hotel where you will spend the next 2 nights. We suggest you take things slowly today in order to acclimatise to Cusco's altitude or even add in an additional day for relaxation. 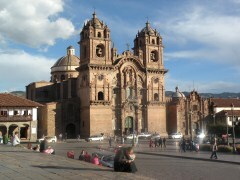 In the evening there are many excellent restaurants to choose from in Cusco. This evening you will have a pre trek briefing with your trekking guide who will provide you with details of your program for the following days. Here you will be provided with hessian bags to pack your 5kg of luggage which will be carried by your guides and also given the opportunity to hire sleeping bags, walking poles and anything else you might require. We suggest taking a good day pack and leaving the remainder of your luggage in the secure lock up of your hotel in Cusco. Today, we discover the Sacred Valley of the Incas on this full-day excursion. This fertile river valley was home to many important sites for the Incas, both strategic and religious. Travel to the scenic town of Pisac where you'll visit the colourful local market and have free time to search for a souvenir or two before enjoying a typical Andean lunch at a local restaurant. We then continue our journey along the River Urubamba, to Ollantaytambo, an important archeological site and an Inca stronghold during the Spanish conquest. return to your hotel in Cusco where you will spend the evening and prepare for your trek. The adventure begins from the fittingly quaint and typically Peruvian village of Marcoccasa, situated high above the Rio Blanco Valley. From Marcoccasa the open pathways on the outskirts of town gradually lead you further from civilization, and into the awaiting wilderness ahead. With the pace and severity of the trekking initially moderate and relaxed; take some time to enjoy lush green valleys, an abundance of native plant species, and spectacular views of the surrounding mountains as you walk during day one. The trail will head deeper into the valley, and mountain range, with verdant plains making way for unforgiving rocky cliffs, and eventually the imposing snow-capped sight of Humantay and Salkantay (the Savage) mountains filling the horizon. Finally, after an overall ascendance of around 1200m /3937ft throughout the course of the day; you will make camp at Salkantaypampa, the perfect clearing to watch the sun rise over the hills tomorrow morning. Max. altitude: 4150m / 13600ft. Campsite altitude: 4000m / 12750ft. After a good night’s rest, and a hearty breakfast, get ready for a day of extremes. This is the longest and most challenging, though also the most impressive day of the trek; with 16 endlessly scenic kilometers (10 miles) to get through, ever-changing scenery, temperature fluctuations and much more. The early-morning will see you crossing grass covered High Andean plains, before making the rocky ascent up to the Salkantay pass. Here, the ‘fields of green’ are replaced by ice pools, biting cold winds, and rocky terrain. Once through the pass, a welcome descent leads down into lush cloud forest and a much more pleasant air temperature, before reaching another open clearing at Collpapampa, which will become home for the night. Today’s hiking will include a real mixture of terrain, loose pathways, steep hills, and forest trails. The scenery is sublime throughout, and the route will be shared with the abundance of wildlife which is prevalent in the area, including Toucans, Hummingbirds, Andean foxes, White-tailed deer, and more, making it a real day to remember. Max. altitude: 4650m / 19700ft. Campsite altitude: 2900m / 9500ft. Feeling refreshed after a night in the mountains, this morning you will follow a pathway which runs adjacent to the life-giving Lluskamayo River for large portions of the day, heading ultimately for La Playa; a small though well-equipped village deep in the valley. As you and the water snake through this fertile region; coffee and fruit plantations punctuate the landscape, which is otherwise thorny bushes, long Ichu grassland, gushing streams and numerous temporary river crossings. The gradual descent will mean ever warmer temperatures, and greener surroundings; which will no doubt make a welcome change from the harshness of yesterday’s high mountain passes. On arrival in La Playa, you can either take a well-earned break in some nearby natural hot springs, stock up on refreshments for the journey or simply relax and enjoy the beautiful surroundings of this Peruvian mountain village. Max. altitude: 2900m / 9500ft. Campsite altitude: 2100m / 6900ft. The final day of trekking will lead you to the fantastically well-preserved Inca ruins of Llactapata; one of the best-known and most iconic ancient sites anywhere in Peru. Later, settle down for the night in the town of Aguas Calientes, your last stop before arriving at Machu Picchu tomorrow. So, after breakfast, head off for a gentle day of walking, which will see you link up with a section of the classic Inca Trail route, before diverting off again, and making your way to Llactapata. 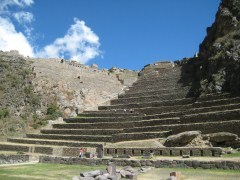 Known as much for its enormous size as it is for the level of complexity and preservation; the Llactapata ruins are a superb example of ingenious Inca construction techniques and agricultural methodology. A guided tour of the complex will offer an informed insight into the people that once lived here, the benefits of their signature stepped terrace farming style and the day-to-day practices of the Empire in the region. After which, you will be taken down a mountain trail to the nearby hydroelectric station, boarding a train to Aguas Calientes, and on to your hotel for the evening. Max. altitude: 2700m / 8850ft. Hotel altitude: 2050m / 6750ft. You will get up early in the morning at 06:00 am to have breakfast and then take the bus to the citadel of Machu Picchu. You will then have a fully guided tour for two hours. Afterwards you have time to explore the ancient city and the surrounding area on your own or to climb up Wayna Picchu (at 10:00 am), from where you can enjoy amazing views of Machu Picchu and the surrounding mountains and landscape. In the afternoon, return by train from Aguas Calientes to the station of Poroy (or Ollanta) (unescorted). Upon arrival you will be met by our representative and transferred to your hotel. Day at leisure before we transfer you to the airport for your outgoing flight. Accommodation with private facilities, hotel taxes, entrance fees, tours with English speaking guides, transfers, meals as specified. For the trek we include all meals, filtered and boiled water, chef and supporting staff, porters who carry 5kg of personal luggage and camping equipment, camping gear, inflatable therm-a-rest mattress, sleeping bag & first aid kit. Hotel rates are based on double / twin share lead in rooms. Other room types and hotels are available. Rates are subject to change and different rates may apply during holiday seasons and special events. 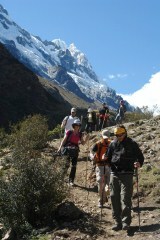 The 5 day Salkantay Trek is physically challenging but within the ability of most reasonably fit. The trail is often steep, and it may rain even during the dry season. The temperatures at night may fall below zero, so it is important to come prepared. We constantly monitor our treks to ensure the fair treatment of our porters and quality equipment. Comfortable and waterproof hiking boots. Clothing should be comfortable, light and fast drying (jeans not recommended). Cotton hiking, trousers cotton long and short sleeve. Shirts, shorts & plenty of socks. Toiletries - including sun block and high factor sun cream, insect repellent & lip balm.